Right as we were first meeting Tammy Powers, a local police officer on Treasure Island stopped us to ask for her autograph. “I want to be one of the first to get it,” he laughed as he handed her his pad and pen. Turns out we weren’t the only one interested in learning more about this formidable trans woman. Just a few years ago, Powers was homeless and living on the streets of San Francisco. Now she runs two successful businesses, both of which she started from scratch entirely by herself. What the police officer -- and everyone else on Treasure Island -- knows is that Tammy is about to be famous. 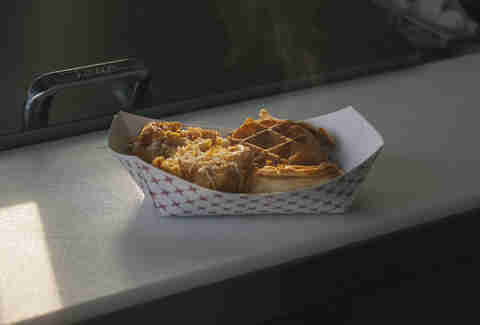 An L.A. filmmaker ordered waffles from her Tammy’s Chicken in Waffles waffle cart earlier this summer and asked a few questions about how it came about. She told him her story. He liked what he heard, so now he’s making a documentary about Tammy’s life. And trust us, it’s a story worth knowing -- and one that may have never happened if Tammy hadn’t started sleeping by the water on a man-made island in the middle of the Bay. Treasure Island was built in 1936-37 for the 1939 Golden Gate International Expo, a fair celebrating the engineering of the Golden Gate Bridge and the Bay Bridge. Technically, it is part of San Francisco, but the only way to get there is via the Bay Bridge or by boat. There are only about 2,000 full-time residents, but on the weekends locals and tourists flock there for the monthly flea market, the numerous wineries, and the gorgeous view of the bridge, the water, and the San Francisco skyline. It’s also the home of Tammy Powers’ two businesses: Tammy’s Chicken in Waffles, a waffle “cart” in a bright pink shipping container, and A Tran’s Bay Bike Shop, the only place on the island to rent bikes or get yours fixed. Tammy does it all herself though, working around 17 hours a day, 7 days a week, so (for now) you’ll have to wait for one shop to close in order to visit the other. But how did she overcome so many obstacles to end up where she is today? We stopped by Treasure Island to chat with her and find out. And, yes, to eat a bunch of waffles, which, for the record, are as good as they look and well worth the trip. What made you decide to make San Francisco home? I’m originally from New York, but I moved to California for high school and after that traveled around a bunch. I lived in Colorado for a while and while I was there, I got really into working at bike shops and doing incredible mountain biking with some really knowledgeable riders, which was an amazing experience. So you moved to San Francisco without a place to live? I got to San Francisco in December of 2010. I was settling in, but I was living on the streets. I didn’t want to go into the shelters because they can be almost like jail -- they oversee you and tell you what you can and can’t do -- and I also didn’t fit. Some of the women are mad at you… some of the men are mad at you… So I said I’d rather sleep on the sidewalk, which I did. And one day I was staring at the new Bay Bridge span -- long before it even opened to cars -- and a light bulb went off that I should open a bike shop on Treasure Island. How did you go from living on the streets to opening a successful bike shop? I went to the offices on Treasure Island and asked, “Where do I rent a place on here?” They thought I meant to live, so they sent me to the wrong place and I said, “No, I want to start a business.” They gave me a weird look like, “Who starts a business here?” But they told me who to talk to. Eventually I found a place that would work, but I had to have insurance, first and last month’s rent, and tools. Thankfully, I got doored by a car — someone opened a car door on me when I was on my bike — so I got a $3000 settlement. It wasn’t much -- most people could never start a business with that, but it was one of the best things that happened to me. The very first day I opened the door of my shop, I didn’t have the next month’s rent. Anyone in the world would tell you that you can’t start a business that way, but I didn’t have a choice. I didn’t have a phone. I didn’t have internet. I didn’t have anything. I just had the will and desire and perseverance and that’s all you really need if you want to make it. I put signs up at all of the bus stops on Treasure Island letting people know a bike shop had opened. People in San Francisco were wary; they told me they’d never seen bikes on Treasure Island, but I said, “You know what? I bet there’s a ton of bikes just sitting in people’s garages that they don’t want to bring into the city to get fixed.” I told them people are just waiting for a bike shop, I know it. And they sure were. How did you come up with the name A Tran’s Bike Shop? 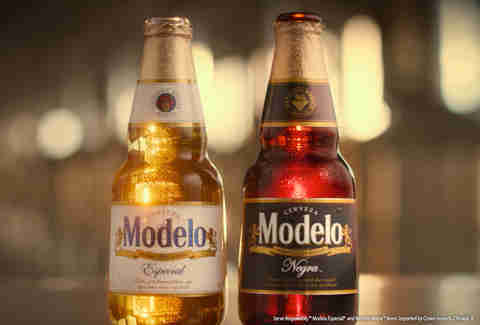 Casa Modelo was born from a revolution 90 years ago -- a revolution meant to preserve the integrity of hardworking people who deserve better and with it better quality beer. What made you want to open a second business? After a year and a half of having my bike shop, I really needed a cup of coffee in the morning, so I proposed to my landlord that I start a coffee cart. He suggested a spot to me that I could never have dreamed of with views of the bridge and the skyline. At first, it was just a pushcart that I hung a wooden sign on that said, “Coffee.” Eventually I got a toaster and started also serving bagels. When I opened the coffee cart everyone said, “Oh my gosh, what a great idea.” I didn’t have the heart to tell them it wasn’t a great idea. Everyone on the island had the idea; I just did something about it. I woke up every morning at 3am to push the cart out to my spot, pull the electricity out of the ground, and plug everything in so I could start serving people coffee by 6am. 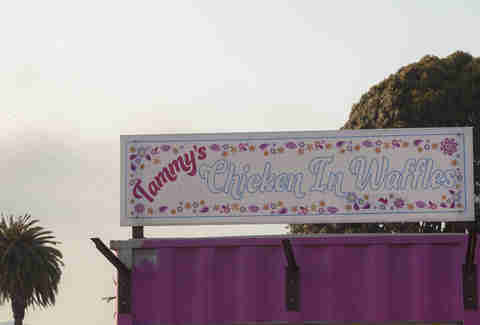 How’d you come up with the idea for Tammy’s Chicken in Waffles? With the coffee cart, sometimes the weather would kill me and I’d have to shut down, so I told my landlord I wanted to put in some sort of mobile structure. I knew I wanted to serve food, but I wasn’t sure what. Someone on the island already serves breakfast burritos and there’s a café that serves great food, like croissant French toast. I wanted to make food that wouldn’t interfere with anyone else’s business. I thought, well, no one’s doing waffles and those are kind of easy. I didn’t know anything about the food industry, but thought, “How hard can it be?” And then I started thinking about how much I love chicken and waffles, and just realized I was going to put the chicken in the waffles. 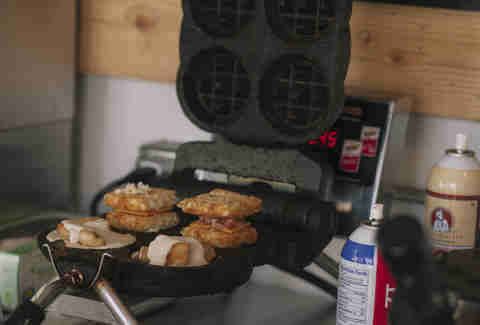 It’s so simple: fully cooked chicken strips on the waffle iron with the batter. And people immediately loved it. Now I have customers I see almost every single day, and also those people who have their day of the week that I’m their treat. So not only do you own two businesses, but you also somehow find time to do stand-up comedy? When I was living on the sidewalks, it was the most miserable time of my life, but I figured if I could make a room full of people laugh, it would help me forget about my troubles for a little while. So I found open mic nights and did that almost every night. That’s what I did with my misery. I have visions. All I do is stare at the Bay Bridge and I have plans for it. I want to open a bicycle shop on the East Bay side of the bridge, so that when the bike path opens, I’m the one doing all of the rentals. When I first set up my bike shop, people would ask, “What are you going to do for all of the people who want to go all the way into San Francisco?” [Ed. note: The new bike path will only run from the East Bay to Treasure Island.] And I was like, I have enough to worry about, but then I realized, someone has to come up with an answer to that and no one has. Eventually, I want to have a bike shop at the end of every bridge with a bike lane in the Bay Area. And a Tammy’s Chicken in Waffles next to each one. I’m also anxious to start hiring trans people, as well as locals on Treasure Island because there aren’t a lot of jobs here. "If someone had told me I’d be here in five years and that I’d have two different businesses.... But I had no choice. What was I going to lose? Nothing. I had nothing else." What do you think the hardest obstacle was to overcome? To finally jump in and begin my transformation -- that was what was misaligned throughout my whole life. It’s wasn’t like some miracle happened where once I did transition everything was bright and sunny. I still had the process of re-aligning everything I’m supposed to be in accordance with my mind, body, and spirit, but now I’m much more settled. It’s bizarre because I had to become a woman to be at ease. And then I had to find out what type of woman I am. I have no regrets -- this is not me lamenting at all because I have no desire to go back -- but I am the type of woman who likes to do guy things and nothing but guy things. I ride a motorcycle. I fix bikes. I don’t really like wearing makeup. I don’t really like wearing dresses. I do sometimes, but usually I’m in jeans. And that’s just the kind of chick I am. You have to be able to see things. And work for it. Work hard. If someone had told me I’d be here in five years and that I’d have two different businesses and own a motorcycle, but to get there I’d have to wake up at 3am in the morning every day for a year and push a cart outside in the dark. And that sometimes before I could even start, the rain is going to start and I’m going to go back inside and be miserable. And that I’d have to do that every day… Most people would say, “I can’t do that.” But I had no choice. What was I going to lose? Nothing. I had nothing else. That’s why I say I’m thankful. Because when I was lonely and miserable, I’d tell myself stop crying and write a business plan. I’d tell myself: Think of something. Be constructive. Do something. Do anything.